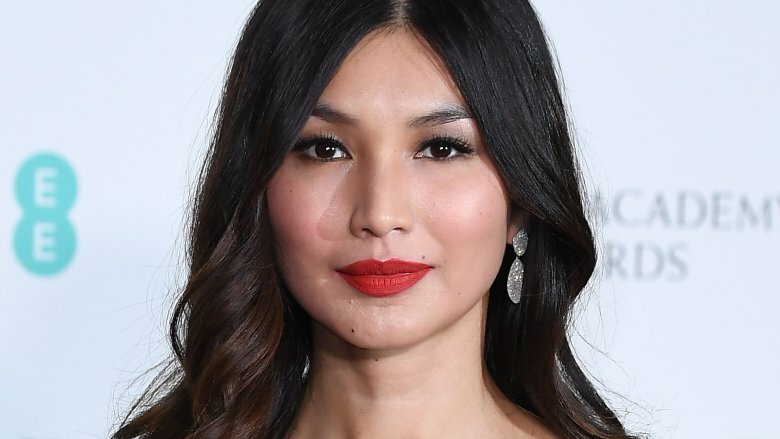 It may be Captain Marvel's solo movie, but Gemma Chan's Minn-Erva is every bit as worthy of our attention — and boy, does she have it after this reveal. Over on Twitter, the actress shared the first look of herself (somewhat) in character for Captain Marvel. "Thanks for the ride," Chan wrote in the caption of a photo that shows her sitting in an official set chair and rocking a deeply parted, teased-up hairdo. Chan, who's character is also known as Doctor Minerva in the Marvel Comics lore, added the hashtag "#thatsawrap" to the snap, suggesting that principal photography on Captain Marvel may have finished on Monday. Granted, the actress could simply be referring to her own scene work, but in any case, it's clear that Captain Marvel is nearing completion. Though this photo of Chan isn't a full indication of what she'll look like as Minn-Erva in Captain Marvel (the character has traditionally blue skin, for one), it appears that it was taken either before the actress began her last day on set or right after she had finished her final scene — meaning that Chan's hair as seen in the picture could be done in the style her character will wear in the movie. As for Minn-Erva's blue complexion, either Chan had to endure hours of body painting like Zoe Saldana did to play the green-skinned Gamora, or Captain Marvel's creative team spared her that fate and will change her skin tone digitally in post-production. A Kree geneticist and an enemy of Jude Law's Mar-Vell, Chan's Minn-Erva serves as the primary foe to Brie Larson's Carol Danvers, Captain Marvel herself. For the film, Chan also shares the screen with Samuel L. Jackson's Nick Fury, Lee Pace's Ronan the Accuser, Clark Gregg's Agent Phil Coulson, and Djimon Honsou's Korath. Ben Mendelsohn and Lashana Lynch also star, but details on their characters are being kept hush-hush for now. Now that we have our first look at Chan's Minn-Erva and it seems Captain Marvel is moving swiftly along the production path, we should start seeing much more of the film that promises to introduce the world to the strongest character the Marvel Cinematic Universe has ever seen.